VisualDx can help physicians avoid diagnostic pitfalls by guiding a process of expert reasoning to assist in the building of strong differentials, and by providing visuals for direct comparison with patient presentations. The use of diagnostic decision support to increase cognitive awareness helps physicians recognize knowledge limitations and cognitive biases, such as confirmation bias and premature closure of a diagnosis, to reduce misdiagnosis and optimize patient care. Frequency gambling (“playing the odds”) is the tendency in equivocal or ambiguous presentations to go with a benign diagnosis on the basis that it is much more likely than a serious diagnosis (Acad Med. 2003;78:775-780). A search of Dilantin (or phenytoin), elevated AST, and other findings present would have suggested to the user the drug hypersensitivity syndrome. The clinician only considered the most common reaction to an antibiotic and did not consider a more serious reaction as a unifying cause of the rash and elevated liver enzymes. The patient was a 42-year-old HIV-positive male with a history of non-compliance with medications. He was admitted for pneumonia. The attending physician was told by the emergency room nurse that the patient had a past history of psoriasis. The patient was noted to have a rash on admission. The attending physician concluded that the rash was consistent with psoriasis, even though it was in a new location for the patient. Several staff members developed scabies over the next 2 weeks, resulting in lost work time and an overwhelmed employee health office. Diagnosis momentum is the idea that once a diagnostic label is attached to a patient, it tends to stick. What might have started as a possibility gains momentum until it becomes definite, and the other possibilities are excluded (Acad Med. 2003;78:775-780). The clinician over-relied on the medical history given by others. Immunocompromised patients often present with new infections or skin disorders related to the immunosuppressed state. 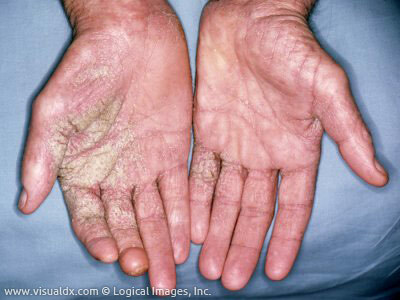 A search in the immunocompromised scenario of VisualDx by thick scaly plaque, hand or fingers, and HIV would have revealed crusted scabies high within the differential diagnosis. The patient was a 52-year-old smoker evaluated for a dental abscess at a primary care walk-in clinic. The clinician noted a white plaque on the contralateral tongue. The diagnosis of oral candidiasis was made, and the patient was discharged with a prescription for oral nystatin. The malignancy went undetected, and the patient was found to have metastatic squamous cell carcinoma during a visit to the dentist 2 years later. Premature closure is the tendency to halt the decision-making process early, accepting a diagnosis before it has been fully verified (Acad Med. 2003;78:775-780). The physician did not consider other reasonable alternatives to the diagnosis of oral candidiasis. A search in the oral mucosal scenario of VisualDx by oral white plaque and cigarette smoking would have revealed squamous cell carcinoma in the differential diagnosis. The patient was a 55-year-old female with two prior hospital admissions for cellulitis. She presented to the emergency department with itchy redness of the lower leg and was admitted for IV antibiotic therapy for cellulitis. 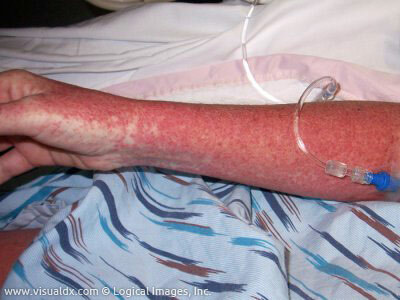 The patient’s clinical course was complicated by Stevens-Johnson syndrome from the unneeded antibiotic. Posterior probability error occurs when a physician’s estimate for the likelihood of disease is overly influenced by what has previously transpired for a particular patient (Acad Med. 2003;78:775-780). The physician was influenced by the patient’s previous admissions for cellulitis and believed the sequence was continuing. The cellulitis differential protocol within VisualDx is specifically optimized for the differential diagnosis of presumed cellulitis. Users can choose a body location, answer two key questions, and have a more accurate differential diagnosis. Searching by leg, unilateral, and pruritus (itching) would have revealed stasis dermatitis in the differential diagnosis. A 23-year-old male presented to the emergency room with eye pain. He regularly wore contact lenses. 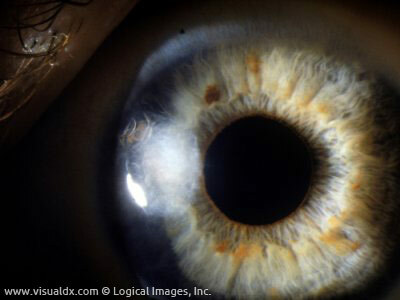 On slit lamp examination in the emergency room, a corneal defect was observed. The diagnosis of traumatic erosion of the cornea was made. The emergency physician prescribed an antibiotic ophthalmic ointment and instructed the patient to follow up with ophthalmology. The patient was seen by an ophthalmologist 1 week later. Availability is the tendency to judge things as being more likely or frequent if they readily come to mind (Acad Med. 2003;78:775-780). A search of cornea/anterior chamber abnormality and contact lens wearer within the eye scenario of VisualDx reveals a differential diagnosis including bacterial and fungal corneal infections as well as conditions with traumatic causes. Contact lens wearers are at risk for corneal infections from contaminated contact lens solution or improperly cleaned contact lenses. Groopman J. How Doctors Think. New York, NY: Houghton Mifflin; 2007. Berner ES, Graber ML. Overconfidence as a cause of diagnostic error in medicine. Am J Med. 2008;121(5 Suppl):S2-S23. [PubMed]. Croskerry P. The importance of cognitive errors in diagnosis and strategies to minimize them. Acad Med. 2003;78(8):775-780. [PubMed].